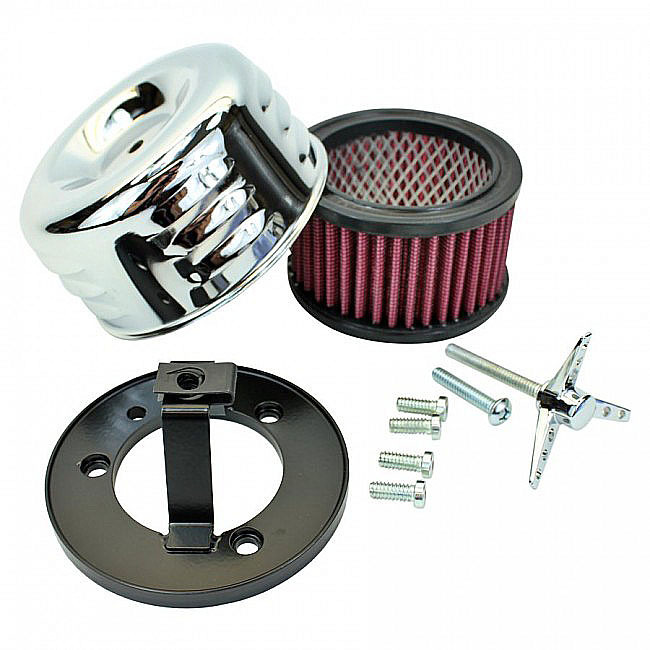 Get rid of your bulky "Ham-Can" style air cleaner and show off your V-Twin Engine with this chrome louvered air cleaner. Kit features CNC machined, powder coated steel mounting bracket that is proudly made in the USA. Included mounting hardware fits into recessed holes to provide proper sealing surface for included filter element. Kit includes both a hotrod inspired Tri-Bar wing bolt or standard round head screw hardware. This ultra-compact kit is designed to fit all Harley Davidson® Big Twin and Sportster models using factory CV Carburetors or factory electronic fuel injection (EFI) units. This kit will not fit 1995-2001 HD Big Twin models equipped with Magneti Marelli fuel injection units using dual bore throttle bodies.